Writing it up or writing it down? Our Heritage Lottery funded “All our Stories” project is being supported by landscape historians at the University of East Anglia. “Writing up your research” was a learning opportunity I thought I could do without – but the opportunity to get some inspiration and some moral support from other projects and the Ideas Bank team at UEA spurred me on. On a brilliantly sunny Saturday morning I headed off to Cromer for the day, not to the beach, but to a training workshop. It proved to be really worthwhile. Where to begin? What story do we want to tell? Who is our audience? What is the best style to use? The session on writing for different audiences was particularly useful – it is to be hoped that this website benefits from what I learned! This entry was posted in Education on August 5, 2013 by wdheritage. About twenty children attended the craft morning on 9th April in the village hall to participate in the Stamford Canal project. Ages ranged from 2 to 11 years, there were also lots of Mums who joined in! The children listened, enthralled, as Liz Noble told a story of Boater the Boat Horse, using some fabulous old props. 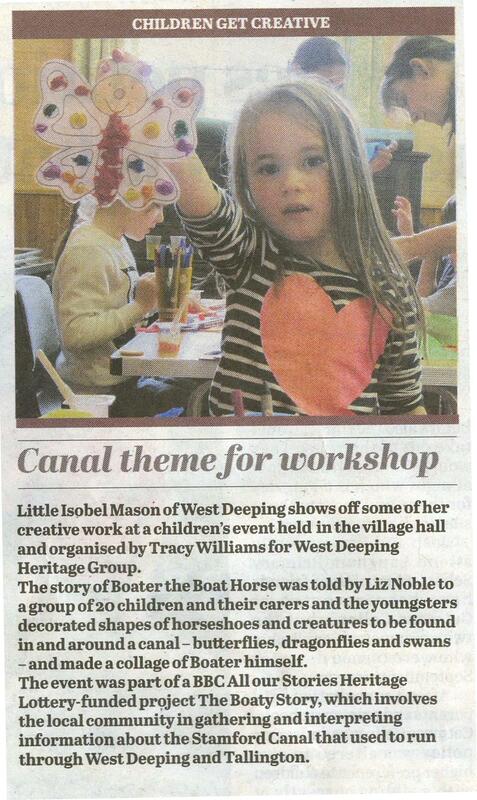 This was the start of a school holiday event in West Deeping Village Hall, organised by Tracy Williams for the ‘Boaty’ project. The children decorated shapes of horseshoes and creatures to be found in and around a canal – butterflies, dragonflies and swans – and made a collage of Boater himself. Liz said: “We used a lot of glue!”. One mother said how much her son and she had enjoyed it. She admitted that, despite having lived most of her life in this area, this was the first time she had heard of the Stamford Canal. Click on the first photo below and scroll through the pictures. Press <escape> to return to this page. Two of the art works have been placed in the Boaty Art gallery. Go to Art Gallery to see these along with other art works collected during the ‘Boaty’ project. Decorating Boater the Boat Horse. Elizabeth telling the Boater the Boat Horse story. This entry was posted in Education, Stamford Canal on April 10, 2013 by wdheritage.